“C. R. Cook, Livery & Bowling Alley.” Digital Gallery. 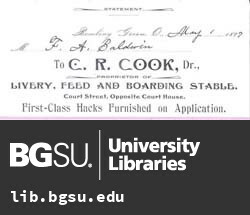 BGSU University Libraries, 4 Aug. 2015, digitalgallery.bgsu.edu/collections/item/14436. Accessed 24 Apr. 2019. In the rear of the Hotel Brown on Court street, Mr. Cook conducts a well stocked and equipped livery, feed and sale stable, while his bowling alley is one of the best in the state. His stable is well arranged and stocked and besides furnishing the most handsome turnouts, he makes a specialty of feeding teams for farmers and others. His horses are stylish and reliable, his vehicles the best, and services are guaranteed to be in every way satisfactory, while prices are reasonable. The bowling alley, conducted in connection, is of the best make and regulation size, and here those enjoying this most popular of indoor manly sports will find their wants carefully attended to. Mr. Cook has been in this business here for the past seven months, and has conducted it with such energy and ability, and is so popular with the people, that he enjoys a well merited patronage and is very successful.